Henry Ford and John Gray founded Ford Motor Company in 1903 with the intent of making automobiles affordable to the average American family. In 1908, Ford was credited with producing one of the “most popular cars in the world,” the Model T (NPR, 2006). The company was highly profitable in its early stages, operating on a model of Taylorism and pioneering the use of assembly line in automobile production. The company has since moved to a more Holistic approach, creating a diverse and motivated workplace culture. Through Corporate Social Responsibility (CSR), innovative technologies, international presence, and strong leadership practices the Ford Motor Company has established themselves as a worldwide leader in the automotive industry. Their place has been determined by a few significant operational and design decisions, such as maintaining affordability and high safety standards, but continued success is reliant upon maintaining successful innovation to meet evolving customer expectations. This analysis does not include Lincoln, the luxury brand of automobiles produced by Ford Motor Company. The Output Analysis will focus on the organizational effectiveness of Ford Motor Company. To assess its effectiveness, Ford’s outputs will be analyzed with respect to several output factors and how they compare to other American automobile manufacturers. The output factors this analysis will focus on are customer results in the automobiles produced, business and financial indicators, employee engagement in the output measures, company innovation, and Ford’s global/societal responsibility. This analysis will focus on two primary customer satisfaction factors in 2012 vehicle models: Dependability and safety. For dependability, or reliability, Ford has performed very well. J.D. Power & Associates 2012 US Vehicle Dependability Study shown below shows Ford well above average in problems per 100 vehicles. While Toyota received the most awards with eight, Ford Motor Company did receive three awards for vehicle dependability (J.D. Power & Associates). Overall, the results indicate a steady safety performance for Ford vehicles. However, the results also show a significant increase in competitor safety performance and Ford is no longer the industry vehicle safety leader as it was a few years ago. Employee engagement can mean many things but perhaps the best definition of it that engagement “is a positive work-related psychological state” and “a motivational state reflected in a genuine willingness to invest focused effort toward organizational goals and success”. (Albrecht, 2010) How much, or how well, the employees buy-in to the company’s strategic goals and success can greatly affect the company’s performance. One could reasonably assume that an employee who really cares and is invested in the success of his or her employer would be more productive and more likely to recommend improvements and seek to improve quality and performance of the products. While employee engagement is something companies strive for and want to foster, gaining it, maintaining it, and measuring it is another thing entirely. Employee engagement is something that will likely be varied individually and over time, fluctuating constantly depending on many variables. With that in mind, perhaps the best way to look at employee engagement is to look at company practices that are intended to foster employee engagement positively. On Ford Motor Company’s employee web page (Ford Motor Company, 2012), the company lists many of the things they do to foster engagement in their employees, including town hall meetings, intranet surveys and chats, joint labor/management committees and diversity councils. Ford also conducts employee “Drive Events” to give employees the opportunity to test drive new vehicles before they are released. This provides customer perspective to the employee and helps promote the vehicles to the public. Ford also uses employees in beta testing of new applications and equipment to provide real-world feedback during product development. This gives the employees a sense of contribution and ownership in the development process they may not otherwise have. Two key sources of innovation within Ford are electric vehicles and connectivity within vehicles. Electric vehicle technology has come to the forefront of clean energy initiatives for automotive manufacturers and Ford has created a goal to reduce carbon dioxide emissions in U.S. and European vehicles by 30% by 2020 with a global electrification strategy. (Hughes-Cromwich, 2011) The strategy is a long-term strategy that starts with hybrid electric vehicles (HEVs) in the short term and full battery electric vehicles (BEVs) in the long term. The success of Ford’s deliberate approach will not be known for several years as their strategy plays out, but they are clearly not being as aggressive as other manufacturers in the field of electric vehicle production. This year have they produced new Ford Focus Electric, which will soon be followed by four others including the Ford Fusion Electric. Vehicle connectivity is another key factor in vehicle innovation as the world in general becomes more connected and technology application based. What started out several years ago with installed global positioning satellite (GPS) systems and Bluetooth connection is now evolving to constant Internet connection with in-vehicle mobile services that include streaming audio/video. Other manufacturers also have similar technology such as GMs OnStar, Toyota’s Entune, and Chrysler’s Uconnect systems. OnStar was the industry leader for in-vehicle communications for several years after starting in 1996 (Borgia, 2009) but other manufacturers are catching up. Comparing the systems to each other is an extremely quirky and personal endeavor with different people rating each one differently depending on their personal needs and uses. In summary, Ford’s SYNC system has reached the forefront of in-vehicle connectivity technology in five short years and competes with the technology of the other manufacturers. The system is continuing to evolve as technology increases. 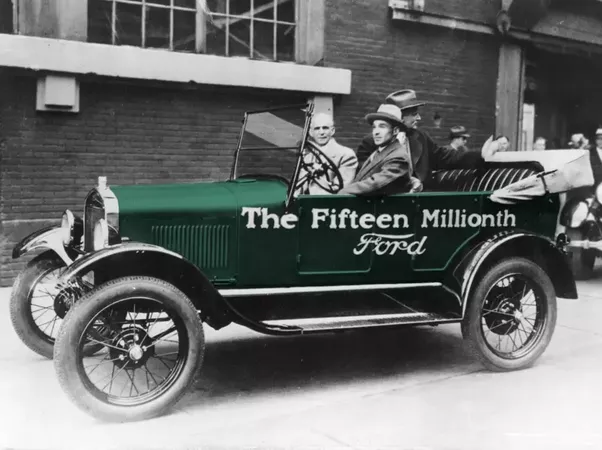 Corporate Societal Responsibility has integrated into Ford Motor Company intrinsically through their ONE Ford Mission and Vision, as shown in Figure below. Ford, as part of its sustainability strategy, maintains seven primary focus areas to achieve sustainability: Fuel Economy, Vehicle Safety, Income, Employee Satisfaction, Supply Chain, CO2 Emissions and Water Use. Nearly all of these are societal in nature as they deal with environmental, education, safety, and energy. Ford, like all American auto manufacturers, experienced a significant downturn in the auto industry during the recent economic recession. What separates the successful companies is how they deal with a volatile economy and how they are able to exploit the business environment during the economic recovery. Ford has not only weathered the recession rather well, but also expanded into Asia where the economy remained strong and established long-term production capability. This section will look at several characteristics of the external business environment as it relates to Ford and will discuss Ford’s environmental initiatives. The production growth in China and other emerging markets is expected to continue along with the economic recovery in the U.S. and Europe, which IBIS expects to produce a 2012 growth of 5.2% in total industry revenue worth an estimated $2.2 trillion. However, despite this projected growth the longer-term outlook to 2017 is more conservative. There is potential growth of less than 5%, as the U.S. and European economies will likely remain sluggish as they deal increasing debt. Several forces drive change in the auto industry. This analysis will focus on three: gas prices, industry structure, and emerging markets. A significant increase in fuel prices over the past several years has caused a shift in automobile production away from larger vehicles with high fuel consumption in favor of smaller fuel efficient vehicles. Figure shows regular gas prices have doubled over the past 7 years. This has driven auto manufacturers to be much more competitive in fuel economy in their vehicles. Another example of external forces affecting the auto industry is the increase in steel prices. Significant growth in developing countries, primarily China, has led to increased raw material prices industry wide. For example, the price of iron ore increased from $60 a ton in 2009 to $180 a ton in April 2010. (International Trade Administration, 2011) Similar increases were experiences for thermoplastics, which increased 16% in 2010. Dramatic price increases in raw materials put the manufacturers in a tough position. Steel suppliers seek shorter term contracts with auto manufacturers to protect themselves from the rising price of ore and while the auto manufacturers want to stabilize the steel costs to better manage car costs and profits. The results is an extremely competitive environment where the demand for cheaper and more fuel efficient vehicles must be balanced with higher material costs. Auto manufacturing is an increasingly competitive industry. The primary competitive force in play is market share concentration. In Ford’s case, market share concentration is relatively low with the four largest automakers accounting for 33.7% of industry revenue in 2012 (IBIS World Industry Report, 2012) and will continue to drop as new companies emerge and large companies split into smaller divisions as Chrysler did in 2007. However, as the market share concentration drops, competition increases as smaller automakers hone in on niche cars that meet the demand for cheap, economic transportation. While many of these smaller manufacturers are not a real competitive threat at this time, they are quickly gaining ground. Perhaps the best example of an up and coming automaker threatening big automakers like Ford is Tata Motors in Mumbai, India. While Tata Motors has been manufacturing cars in India since 1954, the last decade has seen an incredible expansion to other parts of the world. Tata began a big push by acquiring Daewoo truck manufacturing in 2004 and culminated in purchasing Jaguar Land Rover from Ford in 2008 for $2.3 billion in the middle of the U.S. financial crisis. (Fitzwater, 2012) Now, Jaguar Land Rover is producing substantial profits for Tata Motors with sales of $15.4 billion in 2011, a 48% increase from 2010. Tata Motors is a company on the rise. While Ford and other U.S. and European automakers were trying to survive and recover for a recession from 2008 to 2011, Asian companies like Tata are charging full speed ahead taking advantage of a growing market in China. Figure below shows Tata Motors’ growth since 2002. In 2009, Tata Motors introduced a car called the Nano, which sells for approximately $2100 and is currently working on a car that will run on compressed air. (Fitzwater, 2012) This is simply a price point that companies like Ford cannot compete with. Companies such as Tata may not be an immediate threat to U.S. markets due to stringent safety and environmental requirement laws, but they cut into sales in the BRICs. Also, with Tata’s quick rise, it should be assumed they are targeting U.S. and European markets in the near future. Another key to Ford’s success is in vehicle profitability. Ultimately, as in any business, Ford’s success depends on how profitable it is. However, profitability varies greatly depending on the line of vehicle. Large, expensive SUV’s that are popular in America carry a large profit margin and smaller, less expensive cars have a much smaller profit. Given the global demand for affordable and efficient cars, Ford is exploiting that segment of the market by increasing production efficiency and sales of smaller vehicles. With the increases production capacity of four new assembly plants in Asia, Ford will be able to increase their profit contributions from smaller vehicle through greatly increased sales in the BRICs. The internal business environment within the Ford Motor Company has as much to do with its success or failure, as do any external factors. The Ford Motor Company has been able to weather bad economic conditions in the automotive industry and come out ahead, internal business organizational and process changes, and external pressures that could have forced the company to collapse. The internal environment of the Ford Motor Company has been changed significantly over the past decade for the better. If it were not for the current Chief Executive Officer (CEO), the company might not be alive today. Ford is divided into two separate companies, Ford Motor Company and Ford Motor Credit Company, that can provide a full spectrum of automobile selling, lending, and buying (MarketLine, 2012). Alan Mulally took over as the CEO of Ford in 2006. Before him, under the leadership of Bill Ford Jr., the Ford Motor Company was divided between each of its separate geographic regions and the regions acted independently, without cooperation. The geographic regions could be described as different factions that are in conflict with each other. There existed no sharing of information, ideas, technology, or designs between each of the regions before Mulally took over as CEO (The Associated Press, 2012). Ford has historically operated separately in each of its four main geographic regions, North America, South America, Europe, and Asia. These regions also have their own distinct and duplicative processes (Ford Motor Company, 2008). In addition, before 2006, Ford factories around the world produced too many varieties of vehicles and vehicles themselves; Ford dealerships had to even offer discounts in order to sell all of the vehicles (The Associated Press, 2012). Initially this operation made sense for the Ford Motor Company because of sparse communication and transportation infrastructure. As technology has increased, this led to inefficiencies, duplication of effort, and waste of resources, talent, and money (Ford Motor Company, 2008). In 2006, everything for Ford began changing. Alan Mulally took over the company from William C. “Bill” Ford Jr., a direct descendent of Henry Ford, realized that the way his company was headed was going to devastate the company. Bill stepped down as CEO but continued to remain on as Chairman of the Board of Directors. Alan Mulally, after realizing how separated each of the operating regions had become, instituted a completely new management, manufacturing, and design plan across the board. To fix and improve the broken manufacturing process, Mulally introduced what is called a Direct Labor Management System (DLMS) to assist in the production and planning of vehicles. The DLMS improves the assembly process by standardizing everything. Also, the DLMS was implemented to help provide a generic manufacturing process across many different vehicles types. For instance, vehicle structure and frames were standardized across trucks so that one type of frame could be used in multiple vehicle models. The DLMS provides consistent and accurate estimates of product (technical) and non-product (clerical) labor times. By using the DLMS, Ford was able to remove all non-product tasks from engineers, allowing them to focus more time on product processes (John O’Brien, 1989). In addition to the new DLMS, Mulally’s new management style was implemented and executives completed training on procedures and processes. Any executives not onboard with the changes were let go. First, Mulally implemented a new procedure to match production to demand and were able to demand higher vehicle prices. This strategy prepared Ford to better weather the impending harsh economic environment. Ford executives across the company changed the way they conducted business. Executives established weekly business review meetings in which employees voiced concerns and opinions, called Mutual Growth Forums (MGF). This way, direct change is implemented more often. These meetings have become so successful that they trickled down to lower level managers and are considered a staple of the company’s management at all levels. In addition to managers and executives working together, engineers and designers are also encouraged to collaborate to make better products through MGF (The Associated Press, 2012). Alan Mulally remarkably transformed the way the Ford Motor Company operates. Ford still operates internationally, but is more successful and informed in the way it markets, manufactures, designs, sells, and buys vehicles. Ford still has an extensive, strong, and diversified operational network of manufacturing, assembly, distribution, warehouse, sales, administrative, and engineering centers. As a result, the company is better able to manage the way it operates now than it has been in the past. Ford is made up of 69 manufacturing plants, 41 distribution centers and warehouses, 56 research and development and engineering centers, 11,790 dealerships, and 110 sales offices after Mulally condensed operations (MarketLine, 2012). In conjunction with shaking up the organizational structure and physical footprint of the company, Mulally also substantially changed the products that Ford produces. Over the past several decades, Ford has relied mostly on the sales of trucks and sport utility vehicles (SUVs). Ford also manufactured vehicles under the Ford, Mercury, Volvo, and Lincoln brands (Chakraborty, 2012). Before the economic and auto crisis hit in 2008, Ford had begun to restructure its brands and image. Ford shifted to creating additional types of cars including electric and hybrid cars and staking more of its revenue on selling more cars than trucks with the ability to shift production based on demand (MarketLine, 2012). The shift that Mulally instilled in the Ford Motor Company allowed it to survive the 2008 economic downturn where other American car manufacturers could not. Ford is now has a net income which is approximately $6.56 billion higher than its main competitors. Another contribution to a hefty increase in net income was Ford’s investment in alternative fuel technologies to improve fuel efficiency (Chakraborty, 2012). An inhibitor to Ford’s restructuring efforts can be partly attributed to its contract with the United Auto Workers (UAW) Union. The impact of the closure of unneeded manufacturing plants which would result in the layoff of workers cannot be fully seen immediately. Any hourly employees that are members of the UAW must still get paid at a rate of 90% with full benefits until the end of the contract. This pattern bargaining plan, accepted by Ford in 1990, prevents auto companies from easily laying off hourly employees. Mulally’s restructuring efforts will only be fully realized in the future (Maynard, 2006). The change that Mulally has implemented in the Ford Motor Company will be hard pressed to keep up when he is scheduled to retire within the next couple of years. The man that will take over the helm of Ford, Mark Fields, is the current director of North, South, and Central American operations and actually wrote the restructuring plan that Mulally implemented (The Associated Press, 2012). It is yet to be seen of the new organizational changes will survive this change in leadership. Ford is one of the numerous organizations in the United States that use the Internet to run incentive programs for employee motivation, recognition, award selection, and award fulfilment. Online-oriented employee motivation poses various benefits that are advantageous for employees and the organization itself. For instance, promotional events are posted online, reducing the use of paper. These materials can be immediately and efficiently managed. Â Hence, online incentive programs save time, money, and even permit greater control for the organization and employees. Other forms of compensation for Ford employees are programs for Employee Involvement (EI). Â Some of the EI programs are Mutual Growth Forums (MGF), as discussed previously, and the Employee Assistance Plan (EAP). Through MGF the relationship between employees and administration is developed through two-way communication. To do this, the concerned parties conduct regular meetings to discuss matters of mutual interest, such as product plans, competition, economics, holiday schedules and work conditions. The EI program is completely voluntary and takes care of workers who have health problems, drug dependency, or other immediate concerns. The program also includes a referral technique for professional counselling, assessment, and treatment, as well as wellness activities for health risk evaluations, stress management, hypertension monitoring, and so on. These compensations benefits to Ford with enhanced employee creativity, lessened absenteeism, better quality of products, and improved relations between employees and the administration. Ford incorporated the Ford Production System (FPS) in the mid-1990s, an initiative to restructure its manufacturing process to enhance flexibility and efficiency in its automobile production systems. Under FPS, factory employees form teams called “work groups.” (Liker & Morgan, 2011). With this new format, managers of the workgroups are given the authority to make independent work decisions, which eventually result in time savings. Bill Ford is the chairman of Ford Motor Company and most of the decisions in the company are taken care by CEO, Alan Mulally, and a board of directors. The CEO makes the majority of the executive decisions. The role of the board is to select and evaluate the CEO and other top-level executives. (Ford Motor Company 2011 Annual Report, 2011) The board of directors has 17 members. Ford is putting efforts to reach diverse communities by targeting universities with higher percentage of women and minority groups (Reward System in Organizations, 2009). Ford launched its global diversity initiative in 1994 to improve diversity and work life throughout the company. Of its 157,000 U.S. employees, 12.8% of Officials and managers are minorities. African Americans represent 8.7% of all top management posts and 17.3% of the workforce overall (Reward System in Organizations, 2009). Ford has also launched some programs and processes for managing diversity. This has been a key-contributing factor to Ford Motor Company’s goal of global markets and corporate efficiency. The four pillars are: Drive smart, Drive safe, Drive quality, and Drive green. Sync- This is an award winning communication and entertainment system developed by ford and Microsoft. Sync integrates most Bluetooth enabled mobile phones and digital media players. Sync Wi-Fi mobile hotspot makes the vehicle a rolling Wi-Fi hotspot which allows all passengers to access the internet. Blind spot Information System with cross traffic alert system. Roll stability control- Sensors are placed intelligently to detect vehicle roll motion and automatically engage measures to maintain control of the vehicle. Curve control technology- Helps driver to maintain control over the vehicle while making a quick curve. The technology rapidly reduces the torque and also applies brakes to slow down the vehicle. Ford offers world-class quality which challenges the best in the industry. As Henry Ford’s vision, he always wanted to give people most reliable transportation at lowest possible cost. This focus on quality has been the biggest weapon in Ford’s business. Henry Ford II even launched a new campaign called “Quality and Demand Go Hand in Hand” (Armbruster, 2011). The aim of this campaign was to improve quality in Ford products from the very first step of production. Henry Ford II believed that quality would be the determining factor for Ford to lead the market in the tough competition. Ford In 1981,launched the “Quality is Job 1” program which showed Ford’s dedication towards maintaining the quality. Error proof manufacturing- Error proof systems are incorporated to ensure critical-to-quality assembly process which allows constant monitoring during the build. The new technologies include an environment friendly anti-corrosion system that reduces the use of water to half. A 3-wet paint technology that reduces CO2 emission by 15%. Eco boost, ford’s latest technology smaller displacement turbocharged gas engines reduces fuel consumption by 20% and also reduces CO2 emission by 15%. Ford is planning to advance transmissions to six-speed gearbox, which improves fuel efficiency. Ford Motor Company continues to lead the automobile industry on an international level, but will face many challenges as the marketplace evolves. In order to remain competitive, it is recommended that Form motor company improve its investment in the electric car market, facilitate a smooth CEO leadership transition, and evolve CSR programs with customer and environmental demand. Ford has taken a very deliberate approach to developing electric vehicles. While Ford plans to develop and market electric vehicles rather slowly, 25%-30% of the fleet electric by 2020, other manufacturers are leading the way. Tesla Motors’ Model S is a fully electric vehicle that was selected as Motor Trend’s Car of the Year for 2013 (Motor Trend, 2013), representing the arrival of a truly impactful electric car. The Model S was also selected as Car of the Year for multiple other publications including Automobile Magazine. Other manufacturers are introducing electric cars already or in the near term. The recommendation is that Ford monitors the electric vehicle market very closely and look for ways to expedite production of fully electric vehicles if the market demands it. Technology is increasing at a rapid rate with manufacturers like Tesla taking full advantage of the availability of it while claiming over 250 patents related electric car production. Ford should not stand by and let companies like Tesla set the pace in the electric car market. This is not to say that Ford should abandon its current strategy for full electric competition, but simply that Ford needs to stay engaged to be able to respond shifts in electric car technology and market demand. The market for electric vehicles is still emerging, nobody knows the long-term demand, but it is recommended that Ford be at the forefront of that emerging market, in terms of both technology and availability. The Ford Motor Company has been transformed significantly since Alan Mulally took over the helm of the company from Bill Ford Jr. Ford improved under Mulally’s leadership because of his proactive approach to decision making and his stringent plan for leadership and executive reform. A new Direct Labor Management System (DLMS) was implemented under Mulally’s leadership that allows Ford employees to utilize common practices, equipment, and automobile parts. Ford might have some challenge in maintaining its current level of efficiency and its positive revenue flow when Mark Fields takes over as CEO. Even though Fields created the restructuring plan that was implemented by Mulally, Mulally held most of the executives responsible for Ford’s previous decline. It is recommended for Fields to expand upon Mulally’s leadership shakeup and continue to replace executives that have previously contributed to the decline of Ford. Bringing in new management could also introduce a revitalizing spark for the future of Ford. A study by Sun Mi Ha on Ford Motor Company and CSR shows that Ford’s consumers prefer the company’s product based on its reputation for social and environmental responsibility (Ha, 2008). Ford produces electric automobiles, efficient gasoline and diesel powered cars, and is working on reducing the carbon impact on the world (Ford & Mullaly, 2012). Through these initiatives, Ford has excelled; however, CSR is more about reacting to the present scenarios quickly and addressing the demands and needs of the customers. It is recommended that Ford focus more on environmental impact in the future. These requirements continuously evolve and may again in the future as impact of carbon on the environment and water in the manufacturing plants are further quantified. Implementing a minimum CSR requirement will not help Ford compete in future expansion. In these ways, they must be proactive. Top management should manage their environmental and societal impact to ensure a constructive influence.